And doing-it-yourself means that you can use any colours or patterns that your heart (or little one’s heart) desires! It’s an easy way to add more colour to a room or to tie together your colour scheme. 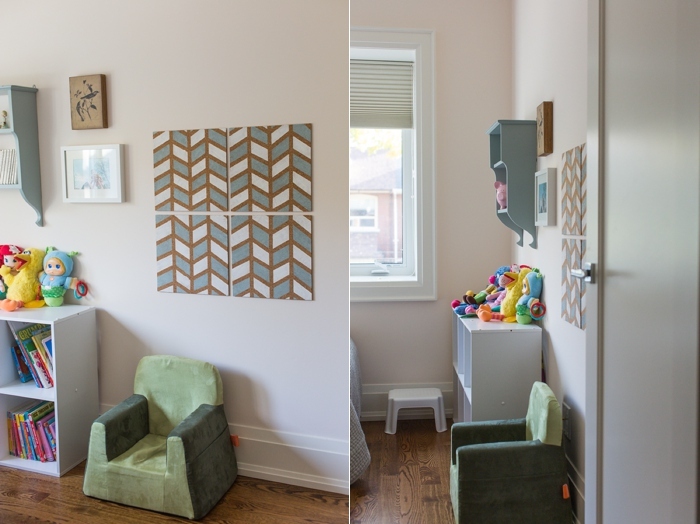 Because Robin’s wall are a a very pale pink (Benjamin Moore’s Opal), I have been incorporating shades of grey and blue to tone it down, as well as other pops of colour. 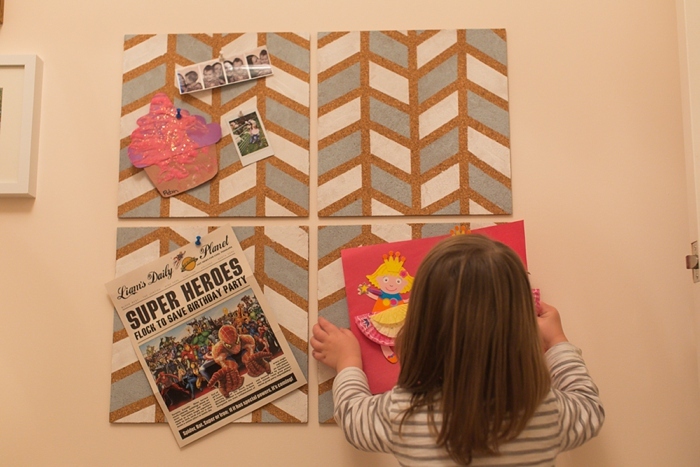 For the pinboard, I decided to go with a herringbone pattern and I used leftover grey paint from the hanging shelf, along with white paint that I already had kicking around the house. 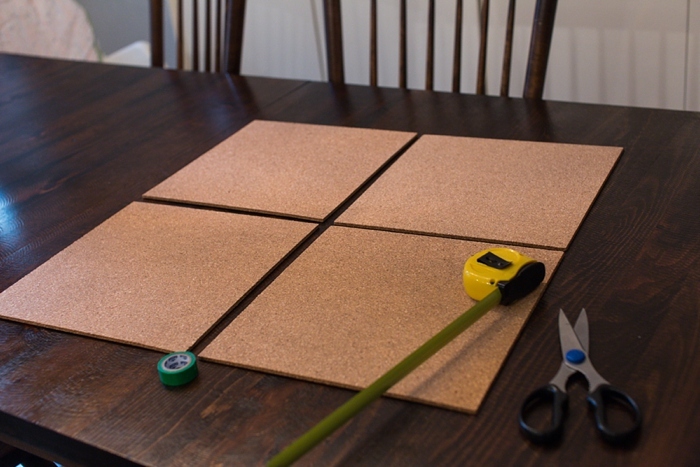 Step 1: Using a ruler or measuring tape, divide the board into 4 equal sections by placing strips of tape vertically down the board. 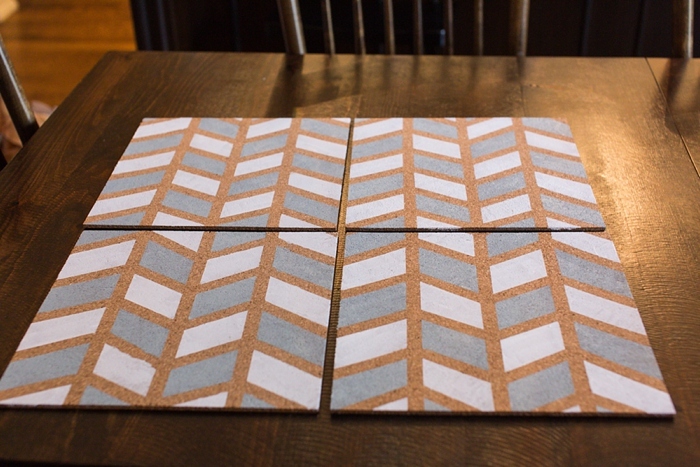 Because my board is 12 inches wide, these strips were placed at 3, 6 and 9-inches across. 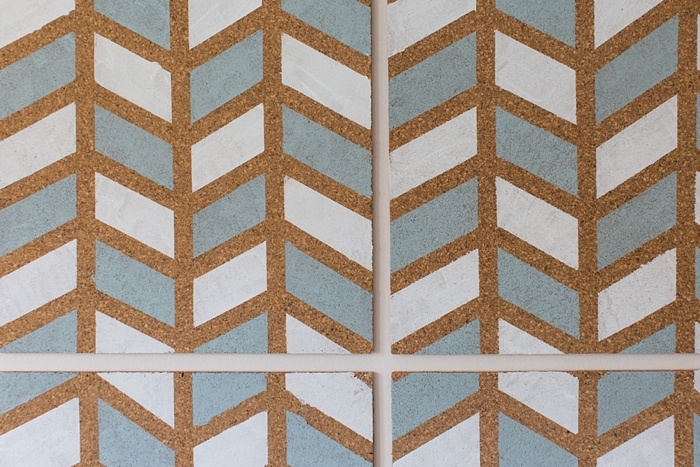 Step 2: Place smaller strips of tape horizontally to create herringbone pattern. I measured 1.5 inches from the bottom of the first piece of tape, made a mark with a marker, and that was the starting point for the next piece of tape. That was the only measurement I made for placing the tape, otherwise I “eyeballed” it. I’m not a perfectionist when it comes to projects like this. After completing the first row, I used that as the base to complete the other rows. I lined up the tape and tried to match the angle as best I could. 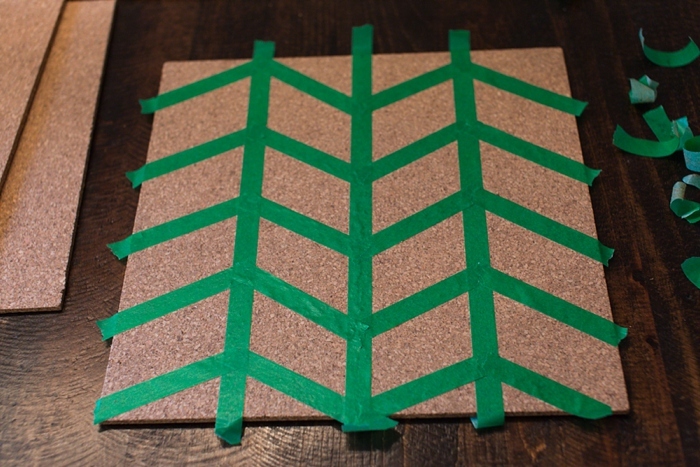 Step 3: Because I was not totally sure of how this was going to work/look, I decided to go ahead and paint the first board before completing the other 3 boards. I started with the grey colour and painted every other “box”. I then did the same with the white paint. It needed about an hour to dry before I was able to pull the tape off. 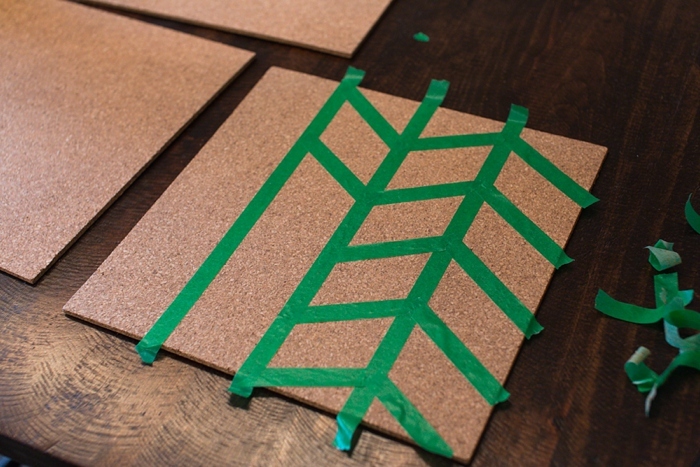 Step 4: Once I confirmed that my technique had worked, I completed taping the other 3 boards by, you guessed it, matching the tape and eye-balling it for consistency. Step 5: Once the taping of the other boards was complete, I then painted the “boxes” starting with grey and finishing with white. The completed board was my starting point and I matched the pattern on the remaining boards based on it. I gave them about an hour to dry and then removed the tape. I was worried that if the tape was left on too long, it might be difficult to remove so I didn’t want to leave it overnight. And it was a good feeling to go to bed having the boards completed and ready to hang! 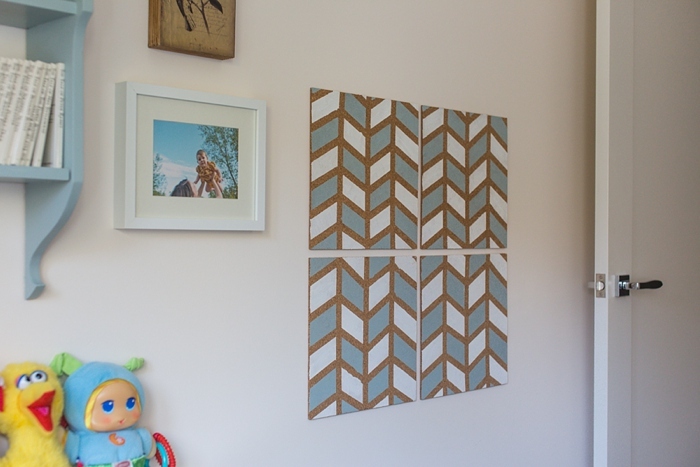 Step 6: I used double-sided mounting squares to hang the boards on the wall. This works well as they need to lie flat. And what would I do without my little helper cheering me on? I love this idea Kimberly, turned out great!